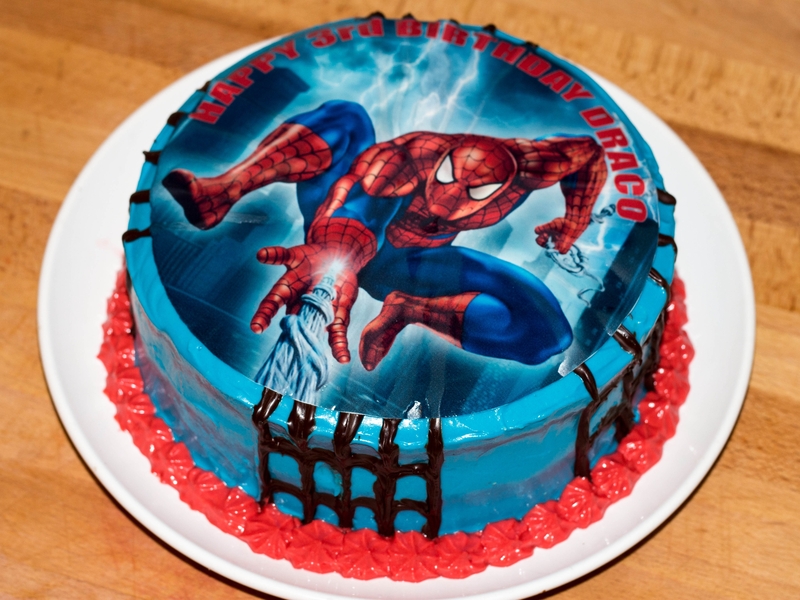 As I am not a mother yet myself, the idea of a Spiderman birthday cake did not even cross my mind when I keenly offered to bake my nephew’s 3rd birthday cake. I love to bake, always have. My fondest memories growing up all begin and end with an empty bowl… although the ending is always sweeter, the beginning held that magical air of creativity and possibility. The thing is, I’ve never put a lot of effort into presentation. I love to get creative with flavours, and I spend a lot of time pouring over recipes for inspiration, but before Mr. Spiderman cake here, I’d never actually decorated a cake past a bit of grated chocolate or dusted icing sugar. So, when told that everything was about a super hero in a red and blue lycra suit for this particular 3-year-old, I was disappointed. Terrible, I know! 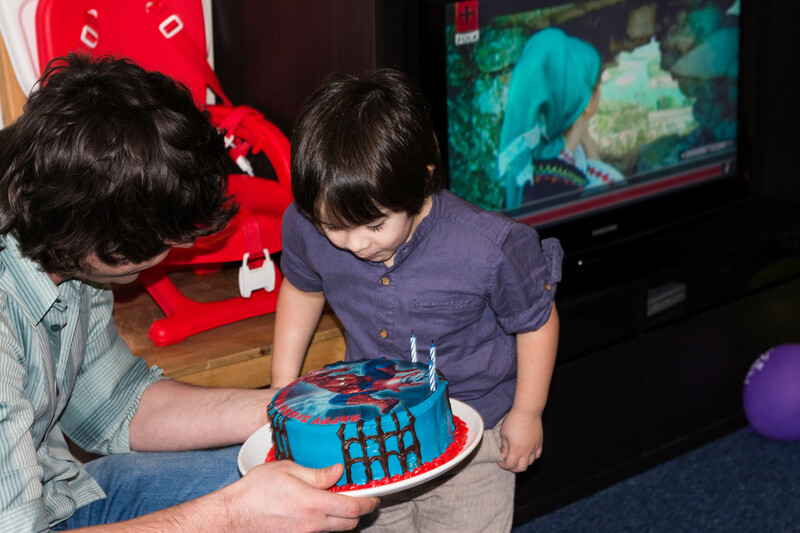 And yes, I do realise it’s not all about me, I just had no idea how I was going to produce the Amazing Spiderman cake I had promised. The first hurdle – I didn’t have a lot of time, so I couldn’t spend hours cutting out different shapes of cake and fondant in the hope that it would all work out in the end. 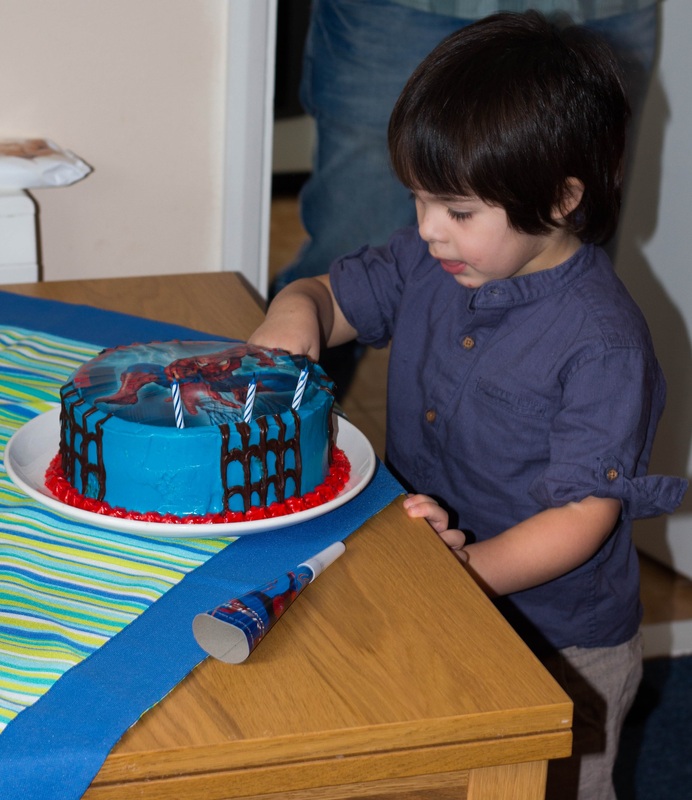 The second – I can’t draw to save my life, so a piped spiderman on a plain old round cake was not an option. My solution was a bit of a cheat, and while I did hurt my baking pride, it turned out alright and the birthday boy was happy! I used a red velvet cake recipe (thought this was Spiderman appropriate) and a cream cheese frosting. The spiderman image was an icing sheet buy here . I also used AmeriColor food colouring as it gives the best vibrant colours, and melted chocolate for the spider web. Yield: one 9 inch three layer cake + 10 cupcakes. Preheat oven to 165°C/325° F/Gas Mark 3. Grease your tins, whichever you decide to use – I used a 20cm springform tin, so I lined the base with parchment paper and greased the sides of the tin. If you are using sandwich tins, you should grease and the base and sides, and then dust with flour. Stir together flour, baking soda, baking powder, cocoa and salt in a medium sized bowl. In a larger bowl, combine the sugar and the rice bran oil. Whisk in the rest of the wet ingredients – eggs, buttermilk, milk, vanilla, vinegar, coffee and food colouring – until just combined. Add the dry ingredients bit by bit to the wet mixture, beating after each addition. You can separate your batter between four bowls and make a four layer cake, or a three layer cake and some cupcakes. My little gas oven is quite inconsistent and a little unreliably, so I bake my cake layers separately for about 30 minutes. I check the cake at 20 and turn it around to even out the cooking. You should not need to do this, but ovens do vary so keep an eye on it. Red velvet should not be over cooked, take the cake out when the skewer comes out clean, or when the crumbs attached to it are no longer soggy! I don’t have a recipe for my cream cheese frosting, I usually make it by taste. In saying that, cream cheese frosting is very simple, and it’s really just a matter of getting your quantity correct. Below is a rough guide to quantities for the above cake – getting this right all depends on the amount of frosting you like on your cake! Beat cream cheese and butter together until smooth and well combined (must be at room temperature or you will be left with lumps of butter! ), then add in the vanilla extract. Slowly add the icing sugar, a little at a time, and beat after each addition. Do not be tempted to stir the icing sugar in – you won’t get the beautiful fluffy texture if you do this! And this is where the guessing game begins. You may find you need more, or less icing sugar – it’s up to you. You will need a certain amount to get the desired texture, but once you get there just taste it and see if you’re happy with the result. Now – fill, crumb coat, and frost your cake! For details on how to do this, see my post on ‘Building Your Layer Cake’.